An early morning start, in early January, saw me racing across the clearing. I needed to beat the critters back to their lantana thicket where they’d bed for the day. Slowing to a more stealthier mode, I looked back to see Julian who was 50 yards back - low on his knees- and stalking as though a deer might pop up at any moment. It was Julian’s first time out on a hunt and I smiled at his predatory behaviour. It was fun to watch, especially since I had already passed thru the area. I remembered the feeling from my first time out bowhunting. I was quite nervous as I accompanied my good friend Pete when he shot a small spiker. Julian didn’t know it yet, but he was about to be in the exact same situation I was. I made the safety of the thistle without being detected, then looked back at Julian. He was now flat on his stomach. I signalled him to pull up the binos and watch. I assured him he would not spook the deer, so he rose to his knees put the binos to his eyes and gave me the thumbs up. I focussed back to the deer, drew and shot. The arrow arced perfectly and smacked the smaller of the two deer right in the sweet spot. He had never seen a dead animal, besides road kill at 100km/hr, and I understood his shock. I did all the work as it really did worry him, but by the time I got it home, hung it, skinned it, gutted it and put it in the fridge he was in there helping me out. Another convert to bowhunting and my first deer on the ground for the year, things were looking up. I had a first go on the Fallow, post rut, and didn’t do any good, but I did get to see a good number of deer and secured two great new properties for future hunts. It was on one of these properties that I nailed my first fox. I was hunting with Andrew Morrow and Adam Greentree and we had whistled a few in, but the wind was playing up and they got the better of us. Finally one stood still long enough at 30m and I let him have it with a Montec that had him on the ground in pretty quick time. I also learnt firsthand that surgical gloves are a must when skinning a dog fox. I swear that smell lingered on my fingers for the next three days, no matter how many times I washed them. Still he was a good dog with a great coat and I was happy to get him, and to do it with good mates made it a little sweeter. The Rusa rut was coming. We had been putting in heaps of time in preparation for the rut and many good stags were glassed and patterned. I finally made my move on a 31-inch stag that was starting to tip out. At first light I was already in position as the mob fed toward me, I shot the one I was after from 18m. Unfortunately I lost that deer to the lantana and spent the rest of the pre rut up in the lantana looking for him, as I was sure he had to be in there somewhere. The hit and the blood trail indicated an effective shot. This put a damper on things and I didn’t stalk a Rusa again until mid rut, as all my efforts went in to finding that stag. They can do strange things when hit and the lantana can be a nightmare when looking for downed game. 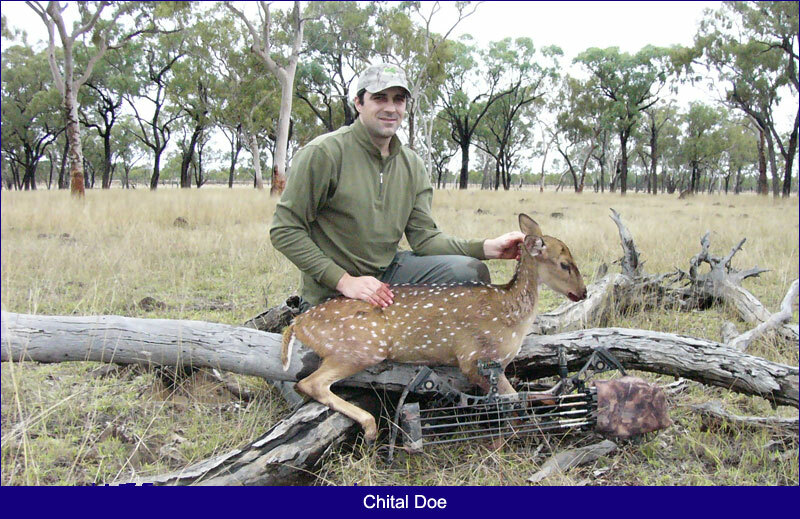 Come the end of June and I was off to Townsville to hunt Chital with Mick Baker from Trophy Bowhunts. 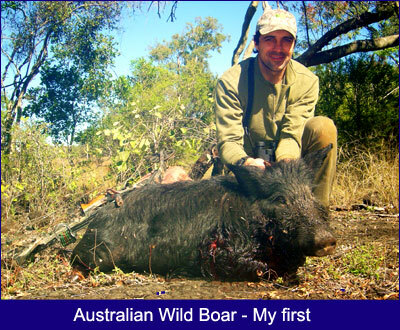 He had invited me and a few other guys up for a hunt as we manage a website together, The Bowhunters Group of Australia, and most of us had not met one another. Well this hunt certainly wiped the foul taste from the lost stag from my mouth, as I stalked and took my first Chital, a doe, in the first ten minutes of being there. In that week we had a wonderful time and I ended taking another small one before I managed to also take my first pig, a small-toothed boar along the basalt wall. The other boys managed a pig and a couple of other deer and the week was most enjoyable with newly found mates that share in the same passion as you. The week was topped off brilliantly when I finally managed to nail a nice stag with Paul Rea looking on with the video. 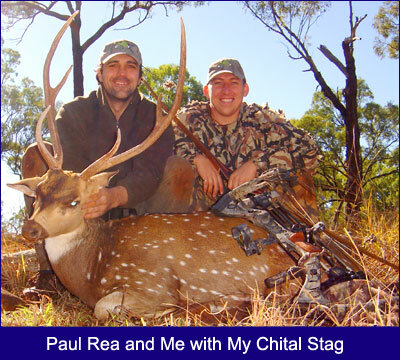 Paul and I hunted very hard together and we had both had multiple chances on good stags. These animals are very good arrow evaders and they frustrate the hell out of you as time and again you question what more you could have done after a missed chance. To have gotten a stag in the end was a shared joy, as these tricky buggers made a fool of our attempts many times over. I had now returned home with renewed enthusiasm, and it was just as well, as the rut was in full swing. Pete had taken a nice, huge bodied stag early on and had been watching the deer in my absence. A couple of stags had occupied a gully, whilst growing velvet, where a heap of does hung out. They were good mates in the off season, but no doubt trouble would be brewing once the does came into season and the roaring commenced, and sure enough it did. I had a day off midweek and Pete had to get to work, so he glassed while I made my way down to our hunting grounds. I could hear a whole heap of clutter in the morning gloom and my vibrating phone confirmed my suspicions as to what all the noise was. Pete had called to ask me if I was ready to shoot a stag, as I was heading long into a battle of epic proportions. The two stags, as expected, were going at it hammer and tong. I was in prime position for the approach and I was going to get my chance at them, though which one I’d get was anybody’s guess. Pete had set himself up with the video camera, work could wait for now, and was filming the fiery battle as I came into his view. One stag was a 26 incher and the other was close to 30. My intention was obviously to take the bigger one, but in a situation like this, you just never know what might happen. When Pete called, I was about 300m away and out of view. The noise from the raging battle rang out right throughout the valley and it was hard to dismiss what was going on. As I neared the gully, all the does, fawns and younger stags were right on edge and I spooked a few back into the bush. The stags were totally oblivious, locked in mortal combat. I made it behind a patch of lantana and took in the action. Numerous times the stags fought right up to me and it sure was scary as they heaved and shoved and belted the crap out of each other. I just prayed they didn’t bowl right into me. I have seen many clashes before, but this one was totally different. These stags were very even in body size and neither wanted to give an inch. The battle went on for near on an hour and I thought time and again to take a shot, but one would never know when the next flurry of movement would come and this was way too risky for a bowhunter, as an arrow could hit anywhere in this situation. Numerous times I had the does come right up to me, seeking refuge from the fighting stags, but they soon moved on when they realised the other threat that was in their vicinity. Sometimes they came in to 2m and I would normally not hesitate at such a chance to fill the freezer, but stags were on the menu so I held tight. Eventually the battle ended and the larger antlered stag was the victor. They had both taken a heap of bark off each other, and it was hard to tell which one came off second best in the damage stakes. He walked over and stood with the does, his prize for victory; whilst the loser was about to have a bad day turn even worse. You could hear both stags breathing heavily in the silent morning. The loser walked straight up the hill to me and bedded broadside, exactly 32m from me, what a gift. He didn’t bed for long and was in the process of getting up when I came to full draw. I settled my pin and let fly. 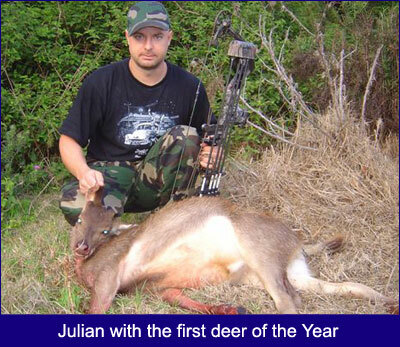 The arrow took him cleanly and that was the end for this stag. I looked to Pete who was pumping his fist; he got the whole scene on video. This made me smile a little more as I knew it would be great to watch. After the redemption of the two stags I felt a little better about things and got right back into it. Around this time, I got myself a new camera and new optics. 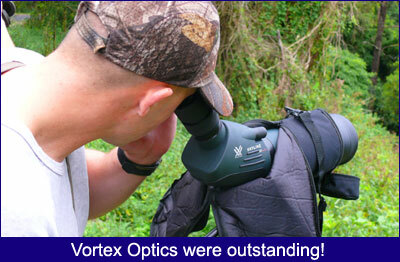 I bought a Panasonic FZ50, some Vortex Stokes binos and was so impressed with the binos, I got myself a Vortex Skyline ED spotting scope. The FZ50 is wonderful addition to my artillery and I found myself taking more pictures than shooting at things with the bow over the next couple of months. A step up at work cut down on my time in the bush, so it was mainly glassing and photography when I managed to get out in the bush. I had Paul Rea come down from Queensland in the hope of getting him a Rusa, but both days out, the weather gods treated us poorly. We then headed south to get some goats and possibly a Fallow. 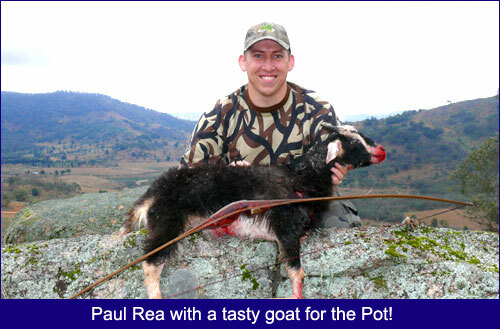 Paul did well to take a couple of goats and his first rabbit at Pete’s farm out west. We then headed further south with Andrew Morrow where we had a rabbit-shooting bonanza (lost all to burrows mind you) and we ended up on one of fallow property that Andrew had recently secured. 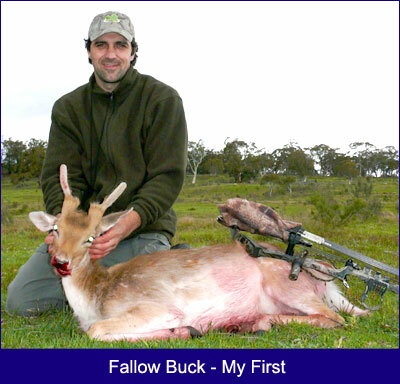 It was here that I finally got to stalk my second ever Fallow. I had one go earlier in the year and didn’t close the deal on an average buck. This time it was a young buck in very early velvet and it was out on a wet afternoon, feeding alone. This was a new property and we really only went to meet the farmer and do a bit of a scout, so seeing this fella really changed things up. As he fed behind a fallen tree I made my move to a large stump and settled in behind it. 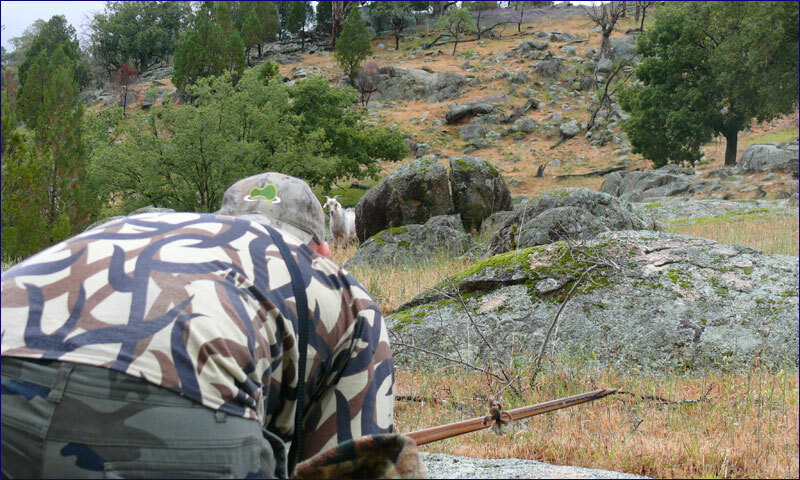 Andrew followed in closely in behind me without disrupting the buck and we were both set for a shot; myself with the bow and Andrew with the video camera. We had a perfect setup with Andrew on one side of the stump, using it as a tripod and myself the other, ranging all the landmarks for when the deer fed out from the fallen tree. The deer finally appeared, but not where we expected as he had doubled back. I had ranged the area and he finally stopped broadside at 30m. With my recent success fresh from the string, I felt I could not miss and whispered out loud that I was going to drill this deer, as I placed my pin on his chest. And that is what happened, the arrow hit home and Andrew got it all perfectly on film. I now had my first Fallow on the ground and got to share the moment with a couple of great mates and that deer sure did eat well. Paul got a stalk a little later, but the wind wrecked it for him so he would have to wait another year before getting his next chance at a deer with his long bow. A couple of weeks later saw another couple of mates come up for a hunt. 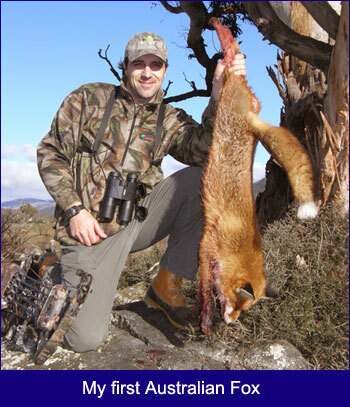 This time it was Tony and Doug Stojanovski, two Melbourne boys who have a vast range of experience on all species, including a few beaut Chamois and Thar from NZ. This time though, they were after their first Rusa and the South Coast didn’t disappoint, as Doug managed a 16 inch stag and Tony an old 26 inch stag that had one of the heaviest bases I have come across. The boys did remarkably well to both get a stag with the bow on their first time up. They had ample opportunities to take does, but to their credit they stuck to their target of getting a stag and that they did. The hard yards paid off as we covered heaps of ground in our pursuit. This was a most enjoyable few days and I got some very good photos due to not taking the bow along. 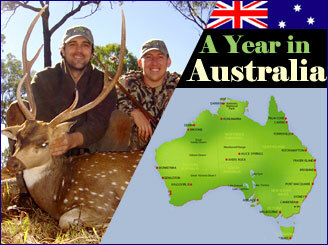 The year was now drawing to a close by this point and Pete and I were on the prowl for some meat and more footage. We got out a few times and on one of our last outings for the year I got lucky once again. It was my turn to stalk and Pete spotted the back of a feeding deer as we moved from clearing to clearing. We weren’t sure what it was but the setup was too good to pass up. I had a relatively easy route to cover the necessary ground to get into range and Pete could film from exactly where he was. 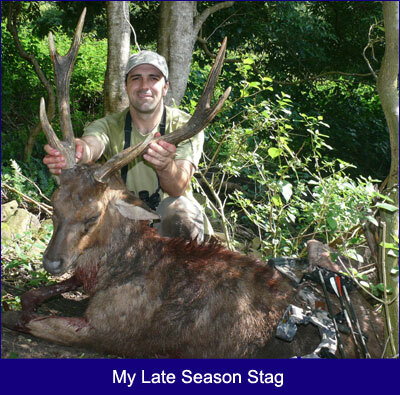 The cover allowed me to move in quite quickly and I sat on the deer at what I had now ranged to be 40m. It was evident it was a stag, going by its size and colour, but I had not yet made out its headgear. Finally it fed out into the open, from my point of view, and it was a decent head. I looked back to Pete who gave me the thumbs up, so I made the decision to try and take him. I was about to draw from a kneeling position, but then I thought that with the cover I had, I could get to my feet and shoot more comfortably. As I rose, the deer reached back to its opposite side to scratch itself with its antlers. This allowed me draw and step out to clear the lane. As he came back around, I shot and hit him in the spine as he dropped at the shot. (This was confirmed when watching the footage) A quick follow up had him down for keeps and another stag was ready to be processed for jerky and sausages. 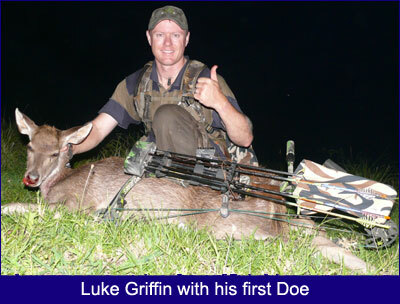 To end the year, I had another mate, Luke Griffin, come down for a final hunt before he moved to China. He had a long time goal of getting his first deer and we hit it hard, hunting from morning till night. We were both relieved when on last light; on the second day, he finally nailed one, a doe from 20m who only made 5m before falling. The shot later revealed a centre punched heart and lung hit, absolutely devastating. It was great to see the sheer delight on Luke’s face, as he had strived for this moment for a long time. We celebrated that night whilst we butchered her up and a couple of mates came around to help. This was a nice way to round the year out, in a similar way to how it started, with the sharing of a new experience with a friend, for a friend. This year holds the promise of more occasions of getting out there with my mates and I am especially digging the photography side of things. Here’s hoping my friends and I can have a similar year with new experiences to fill the memory banks and more animals to fill the freezer.